Tampa, Florida is the home to many different moving companies. Certain things should be considered when you are choosing Tampa movers to take care of your moving needs. Quickness and affordability are two of the most important factors when considering movers in Tampa. The qualifications of the moving company are also vital. 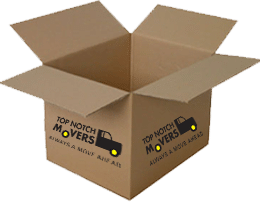 Top Notch Movers is the company for you. We are a full-service moving company which includes not just the moving of your possessions, but the packing as well. When you hire us, we will come to your home, pack your belongings, and move them wherever you wish. As movers in Tampa, it is our recommendation that you come up with a checklist of all of your possessions that need moving before calling any company. After you have done this, you can call the Tampa movers, and you should be able to give them the list, so the moving company knows exactly what you need moving. This checklist gives both you and the mover insight at how much the move would cost, which is a benefit to both. There are moving companies that choose not to give estimates to people over the phone, be careful when dealing with a company like this. This type of company will claim that they need to start working before giving you the price, eventually leading to you getting blindsided. Any moving company that you hire should be able to give you a good estimate over the phone. Top Notch Movers will give you an estimate before we start the moving process. When you call Top Notch Movers for an estimate, it is always going to be free. When you receive that estimate, you can let us know whether or not you would like to proceed, and then we can send an employee to you to give you a more accurate written quote. Qualified Tampa movers should not have a problem with this. Some companies will try to push additional fees on you; including service, labor, and boxing. Be careful when dealing with these companies, make sure you always have a written quote before the moving company begins to work. When you are choosing your movers in Tampa, make sure that the company is both licensed and insured. This is important because if one of your possessions were to break during the move, you might not get compensated for any damages. Suing the company is not really an option because the legal fees would cost you more than the amount in damages. Top Notch Movers is both licensed and insured so if anything happens during the move you know that you are covered and will be reimbursed. 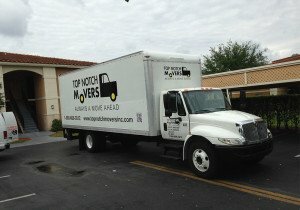 Who Benefits from our Movers in Tampa? As a business owner or a provider of a commercial service, packing, moving, and storage may affect the process of your everyday business. From organizing computer cords and cables to safely packing your company’s fragile items, Top Notch Movers has the professionals to execute your commercial move in a most timely organized and affordable manner. Keep your business running throughout the move by focusing your efforts on the function of your business and leave the lifting to the pros. Whether it is a long-distance move or a local move having a moving company you can trust with your priceless possessions is essential. Save time and money with having a moving company to do your move. Keep you and your family safe on moving day, and the Top Notch will handle the rest. As you get older, your body and its capabilities are not what they use to be. Being a senior in today’s world can become complicated at times, especially when moving. Having an experienced moving company to move your belongings is almost a must after you reach a certain age. You can put your trust in Top Notch Movers; Top Notch has been moving seniors at an affordable discount for over 15 years. Veterans have it tough adjusting to everyday life after serving in any armed forces branch. Moving doesn’t have to be one of those speed bumps you have to cross. Keep your time free to focus on you and your family. You might even find something in common with the military veterans in the Top Notch staff. As an experienced and professional moving company in Tampa, Top Notch Movers has your back. As Tampa movers, we always offer our clients the best customer service that is unmatched by other companies. Customer satisfaction is our ultimate goal, and if we have not met your satisfaction, then we are not happy. Call us today for a free quote. Why should you Hire a Moving Company in Tampa? Having a moving company in Tampa to take care of the heavy lifting and organizing is a great way to save money when moving. With the housing market fluctuating how it is today, anytime is a great time to find a wonderful piece of property in Tampa. You will want to have a professional moving company ready for your moving needs. Find that perfect family dream home or the vacation home you visit a few times a year. A moving company can facilitate all your moving needs. From planning to purchases and expenses to missing time from work! Moving is no easy task. Even if you were to find the time to move, would you even know where to start, how to drive a big truck with your valuables, or how to lift a box properly? Save yourself the time and headache and hire the moving professionals. 1 in every 3 Americans has suffered from a back pain or disorder at one point in their life. Carrying, packing, and moving heavy items is not a task everyone can handle. Carrying a heavy item without the proper technique can put your life, and your loved ones lives in danger. You should hire a company that has the professionalism and experience to handle the obstacles associated with moving a home or business. Top Notch Movers trusted and affordable moving services will make sure you never have to put you or your families safety at risk.